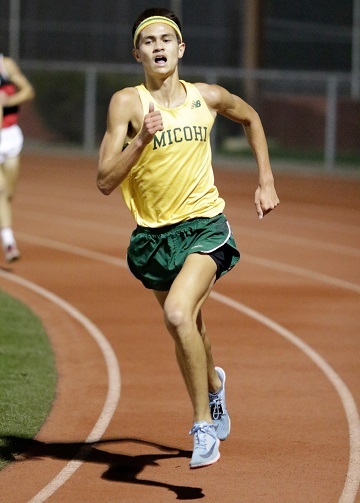 Mira Costa’s cross country program continues to excel winning four of six competitions in the varsity, junior varsity and freshman races of the Bay League finals. Although its boys team dropped one spot to No. 14 in the CIF-Southern Section Division 1 poll, Mira Costa’s girls jumped up four spots into the No. 3 position. 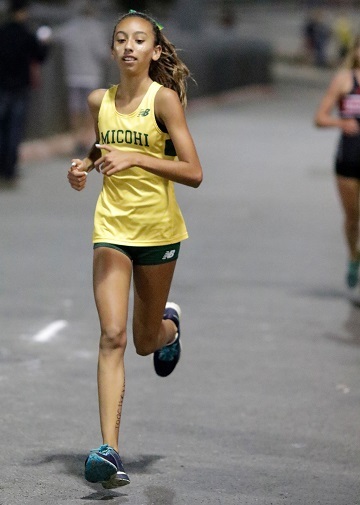 Dalia Frias continued to excel in her freshman year at Mira Costa, capturing the 3-mile girls varsity with a time of 17 minutes, 21 seconds outpacing Palos Verdes junior Savannah Scriven (17:43) and teammate senior Lucy Atkinson (17:52). Joining Frias in the top ten were fellow Mustangs senior Brooke Inouye (4th, 17:53.3), junior Pnina Tofler (7th, 18:28.2) and junior Piper Newton (9th, 18:35.8). Mira Costa scored 23 points, well ahead of Palos Verdes (43) and Redondo (55), who was led by junior Molly Ann Hastings (8th, 18:29.1) and sophomore Montgomery Allison (10th, 18:43.9). Redondo is ranked No. 9 in Division 1. The increased depth for the Costa girls has been a plus this season, particularly during training sessions. Williams-Smith expects her squad to have a strong showing in the postseason. “It was definite a boost to have Olivia Hacohen back on the starting line after a five week layoff,” Williams-Smith said. “We have been lucky to have the varsity experience of Brooke Inouye, Lucy Atkinson, and Pnina Tofler to guide the newcomers, especially Dalia Frias who has been an amazing addition to the team. She is a freshman with no running experience who used to play ice hockey. She was Bay League Champion by approximately 20 seconds and runs effortlessly. In boys competition, Palos Verdes had three top-ten finishers to win the title with 40 points, narrowly defeating Mira Costa (44) and Redondo (54). Palos Verdes’ boys and girls teams are ranked No. 1 in Division 3. Mira Costa senior Cy Chittenden (15:04.6) edged Palos Verdes teammates William Teets (15:06.1) and Nathan Lantz (15:09.8) for the title. Other top-ten finishes included Mira Costa senior Cole Gamble (6th, 15:31) and junior Thomas Velvin (9th, 15:34.7) along with Redondo runners freshman Christoph Waligorski (5th, 15:28.5), senior Benjamin Tait (8th, 15:34.6) and junior Jackson Chambers (10th, 15:37.3). Mira Costa won the boys and girls JV races with 10 runners finishing in the top-ten of their respective divisions. Carmen Mel won the girls race with a time of 18:36 outpacing teammates Cara Chittenden (2nd, 18:41.6), Tia Pappas (4th, 18:48), Allyson Doyle (5th, 19:05), Cassidy George (7th, 19:19) and Julia Vazquez (8th, 19:19.3). In boys competition, Palos Verdes Frankie Reid won the title with a mark of 15:47.2 followed by Mira Costa’s Will Garrell (2nd, 15:56.7) and JP Soares (3rd, 16:31.5). Also placing in the top ten for Mira Costa were Blake Hampton (8th, 16:42.6) and Caleb Hong (9th, 16:42.9). In the freshman race, Redondo’s girls team recorded 24 points to defeat Mira Costa (32) while Mira Costa captured the boys title with 30 points, well ahead of Peninsula (53) and Redondo (65). The CIF Southern Section Championship Preliminaries will be held Saturday at Riverside City Cross Country Course followed by the Championship finals on Saturday, Nov. 17. The State Championships will be held Saturday, Nov. 24 at Woodward Park in Fresno.